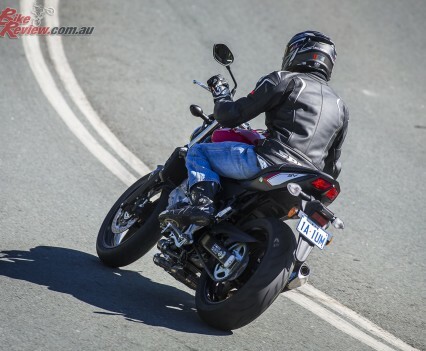 Having tested Suzuki’s Gladius in the past I was impressed with their LAMS offering, and personally always liked the styling, but it was a bike that tended to polarise motorcyclists and when you’re trying to entice new riders into the fold a bike with wide appeal like the new SV650 is the best bet. 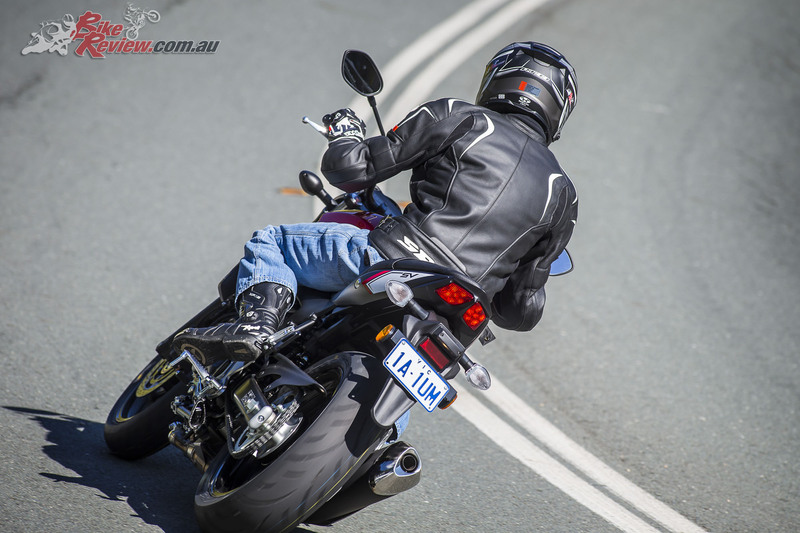 Afterall, what motorcyclist doesn’t take a bike’s looks into account when making their choice? 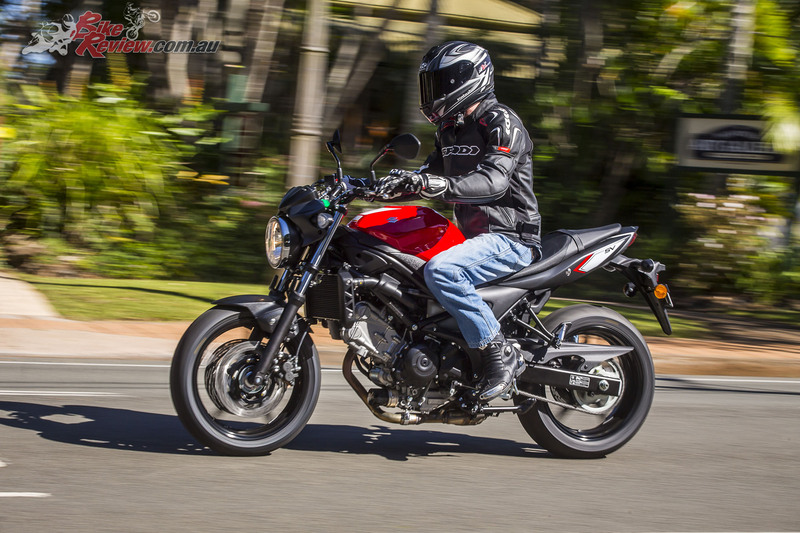 Suzuki’s heavily refined SV650 is the answer to that and replaces the Gladius, using the 645cc V-twin engine that’s graced over 400,000 motorcycles but with 60 new or revised engine components, styling that goes back to the 1999 original’s concept and a host of chassis improvements. 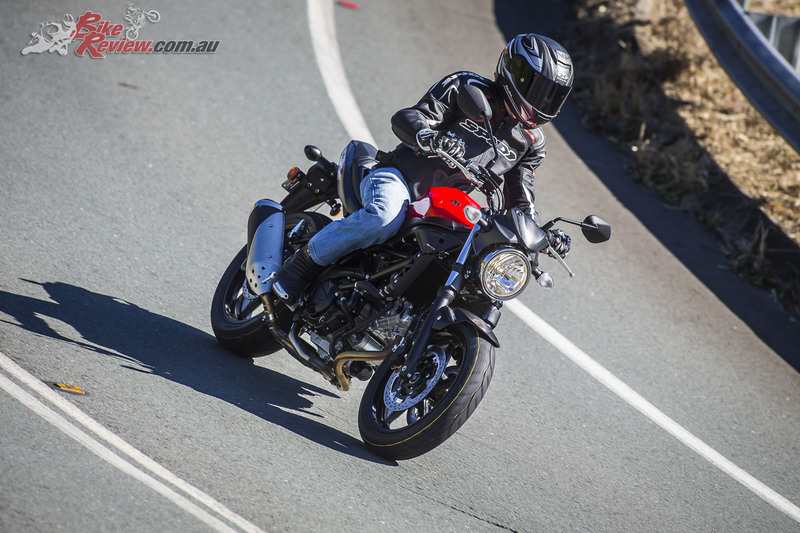 The new 2017 Suzuki SV650 is a much sharper package than the previous Gladius, offering a sportier all-rounder, ideal for commuting or learning the ropes. Plus there’s good fun to be had in the twisties. 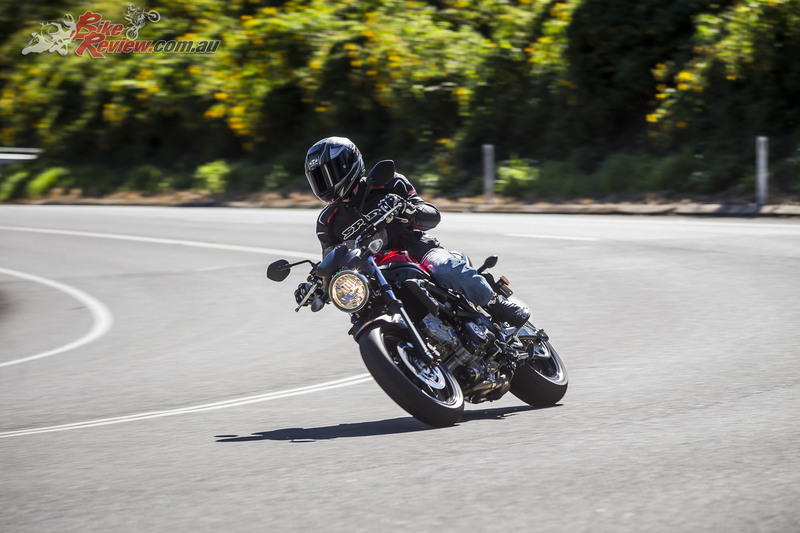 On the surface the new SV650 is a basic motorcycle, with simple but strong styling, good performance and the ideal platform for a learner motorcyclist. 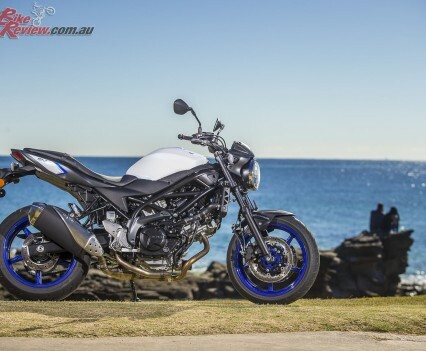 With looks that are very unlikely to upset anyone, and are sure to appeal to any nakedbike enthusiast, the SV650 is redefining Suzuki’s focus on the larger capacity LAMS market, with their intent clearly to renew the SV’s glory days. 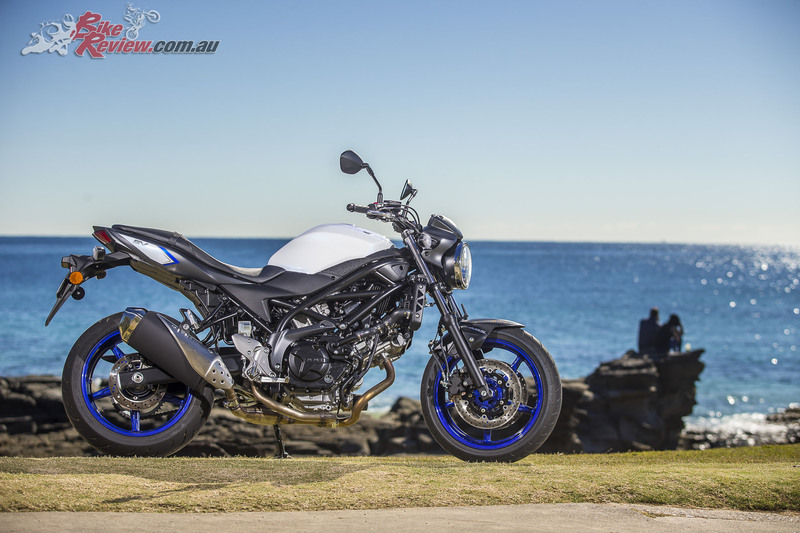 As mentioned the SV650 still uses a 645cc 90º V-twin, but has seen a massive overhaul with 60 updated or redesigned components. These include FEM pistons, coated piston skirts, SCEM plated cylinders and 10-hole long nose fuel injectors on each 39mm throttle-body. The throttle-bodies include a throttle-body Integrated Idle Speed Control and there’s also a Low RPM Assist function, redesigned air cleaner, and staggered airbox funnel lengths for better mid-range torque. The exhaust is lighter, while engine cases are updated for a sportier look, with a new high efficiency radiator fitted for better cooling. Plus there’s also the Suzuki Easy Start system, allowing the bike to be started with a single press of a button. 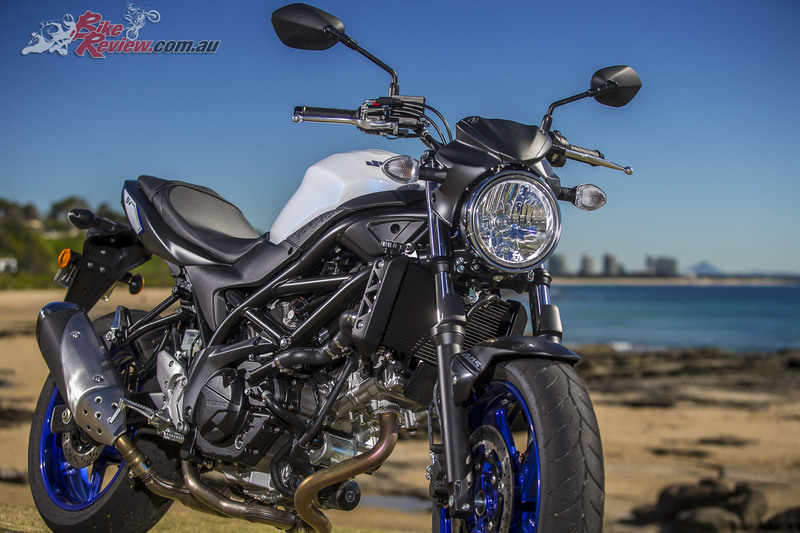 At 180cm the 2017 Suzuki SV650 was spacious, light and easy to throw around, with a low centre of gravity ensuring new riders won’t feel intimidated at low speeds or when coming to a stop. What does that mean for the regular punter? 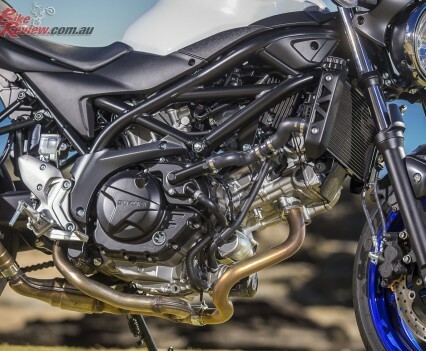 Well the SV650’s powerplant is designed specifically for this segment, with power maximised for the LAMS power to weight ratio limitations and peak torque (56.5Nm) available from just 4000rpm, rather than up in the 8000rpm region like on the unrestricted version found overseas. 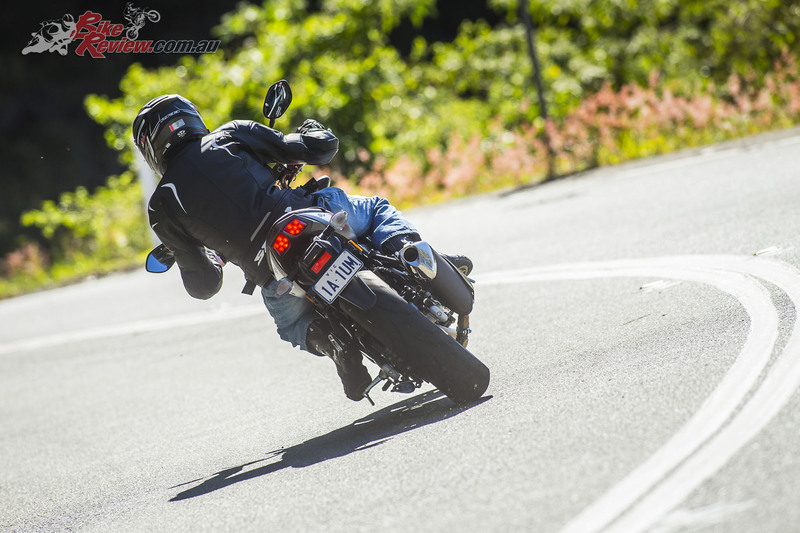 The V-twin is exceptionally smooth, with strong throttle response and a very light and quick revving feel, with the Low RPM Assist helping prevent embarrassing stalls as a real learner, but honestly having very little impact (or any noticeable effect) as a more experienced rider. 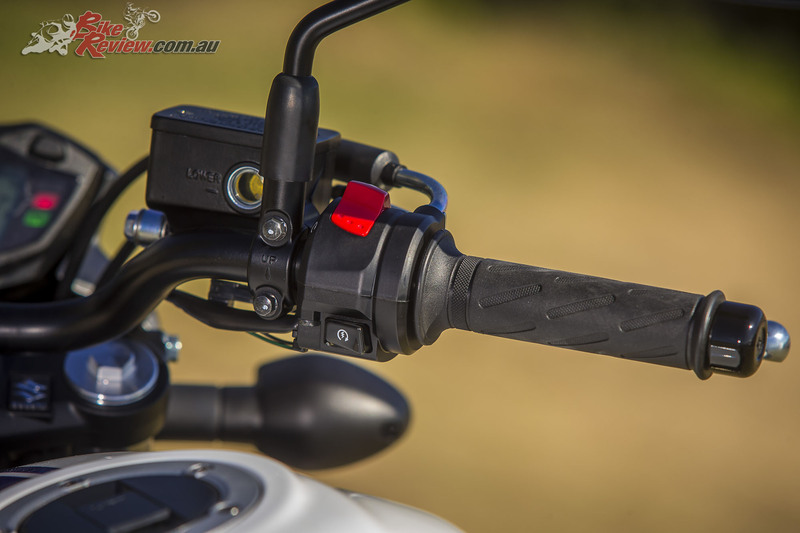 Gearing is relatively tall, which suits the bike’s easy revving nature and relatively linear power and torque in the low to mid-range, ensuring a very manageable ride. This isn’t a criticism either, it makes the machine an extremely competent commuter and the perfect first pick for any learner, where some of the larger capacity LAMS machines are simply not the most ideal place to start. Peak torque is available from right down low, offering good drive and acceleration, while the top end offers the thrills for those after a bit of hooning or getting cranked over. But what about the ‘real’ performance, for those who like to have a bit of fun? 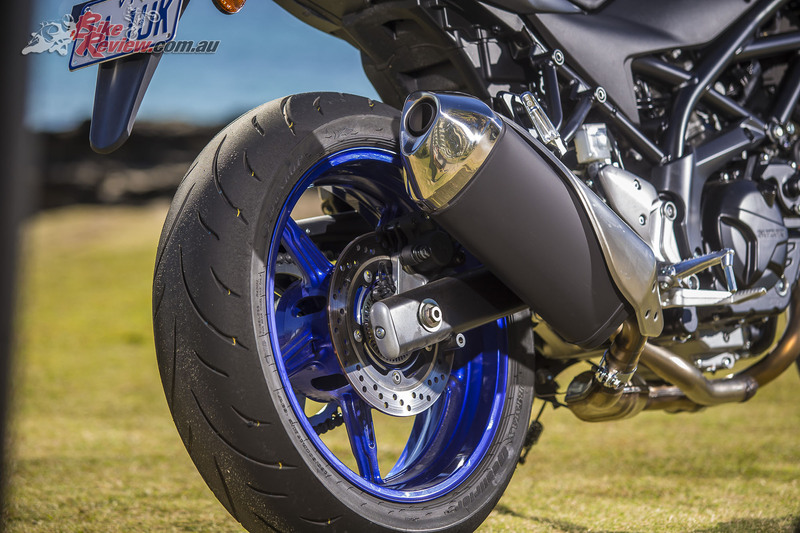 Not to worry, wind the SV650’s throttle on and between 7000 and 8000rpm the bike comes truly alive, with peak power delivered at 8500rpm, and an easy 3000rpm range of full power and instantaneous throttle response for all your hoonish performance needs. 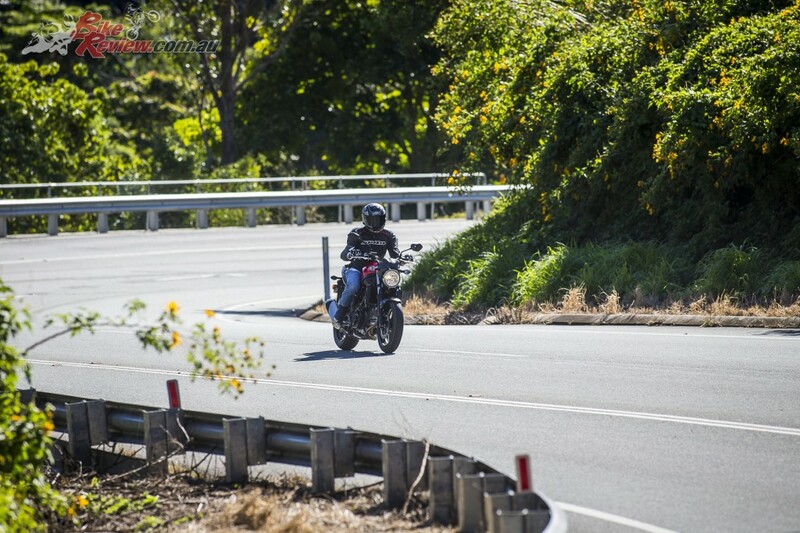 Through the twisties you do want to keep the revs up, if you let them fall too far you’ll have to wait for the engine to rev back up to the sweet spot for that punch of power, but that’s a rider issue and bike characteristic rather than a problem. Plus I’d probably consider lowering the gearing on the SV650, which isn’t something I would normally ever think about on a LAMS machine, as you can easily afford to trade off some top end for a bit more acceleration, especially as you gain more experience. 120km/h plus is easily achievable in third gear, and that’s not red lining either, so you know there’s plenty of go still available. 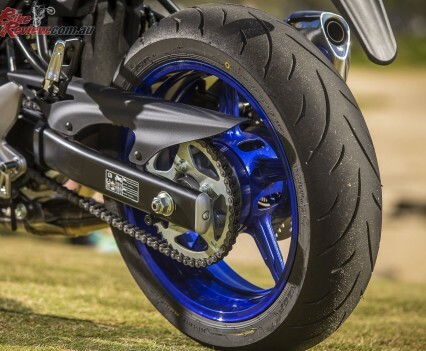 The relatively light gearbox and gear changes also mean you wouldn’t mind working the gears a bit more if you did opt for this mod, while engine braking is nowhere near as powerful as you’d often expect on a V-twin, allowing for aggressive downshifts. 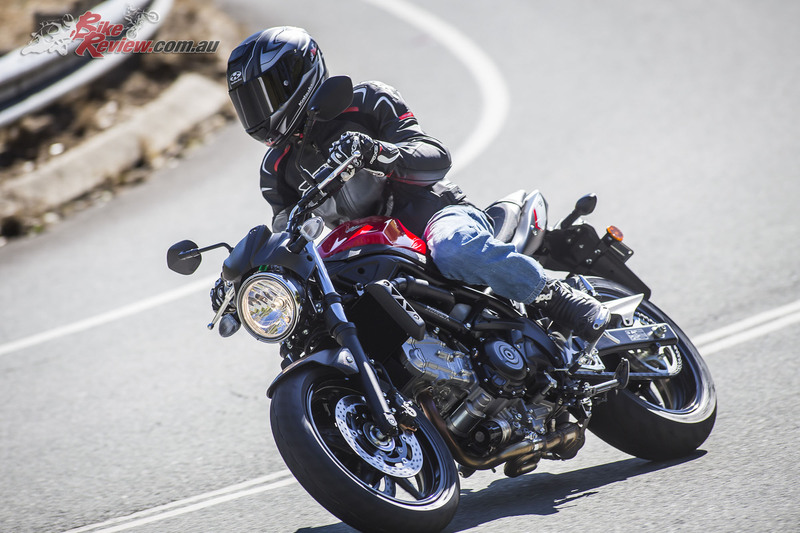 The 2017 SV650 is as home out on country roads as it is in the city, with plenty of power for overtaking, highway riding, or keeping up with mates on their unrestricted bikes. 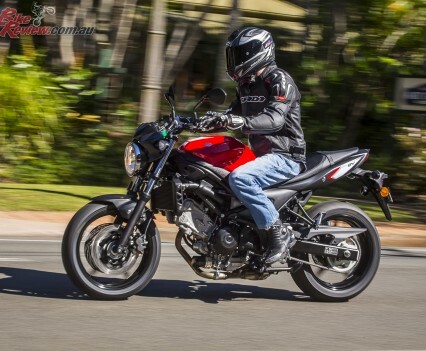 Apart from styling the other really noticeable change on the SV650 from the Gladius is the chassis changes, with Suzuki claiming 80 parts and components have been redesigned or changed. 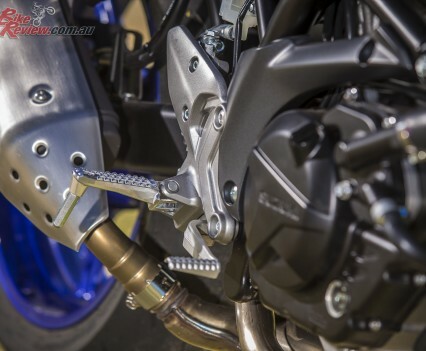 The most obvious is that Suzuki have managed to further trim down the bike’s width, particularly at the seat, between your knees and across the tank. Combine this with a 785mm seat height – the lowest in its class – and again you’ve got a machine which is doing its upmost to provide a learner friendly starter point. The distinction to make here is that a low seat height is offset by the bike’s width, especially across the seat, which in turn effects how easily someone can reach the ground, which is why bikes with similar seat heights can feel so different. 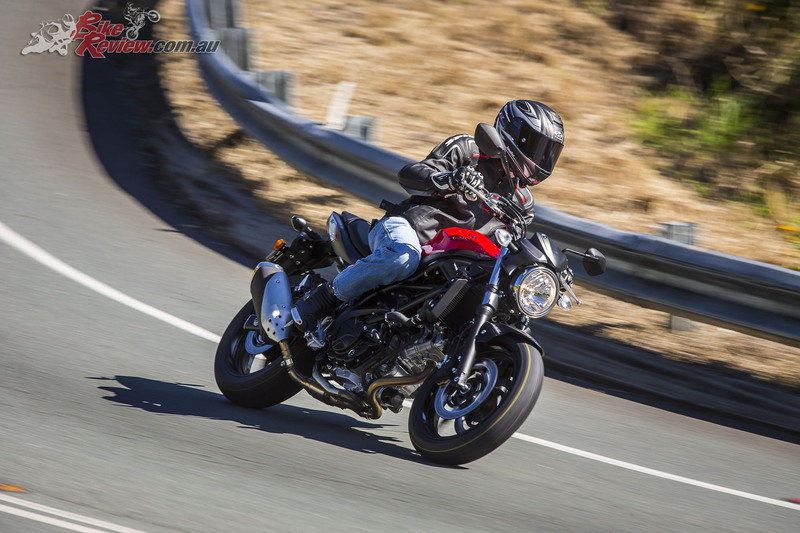 The SV650 is ideal for anyone of the shorter stature for this reason as they’ll easily be able to get both feet down, maybe not flat, but with a solid foot hold. For my 180cm height, and longer legged stature I had both feet totally flat to the ground, with the bike feeling like it had a nice low centre of gravity and plenty of clearance. The thin V-twin engine and revised chassis that has further trimmed down the seat and tank width allow for easy movement on the bike. Reach to the ‘bars is also short, which benefits smaller riders, but also meant I wasn’t left feeling like I was stretched out, complementing the light steering and roomy pegs, which left my knees perfectly positioned in the contours of the tank. 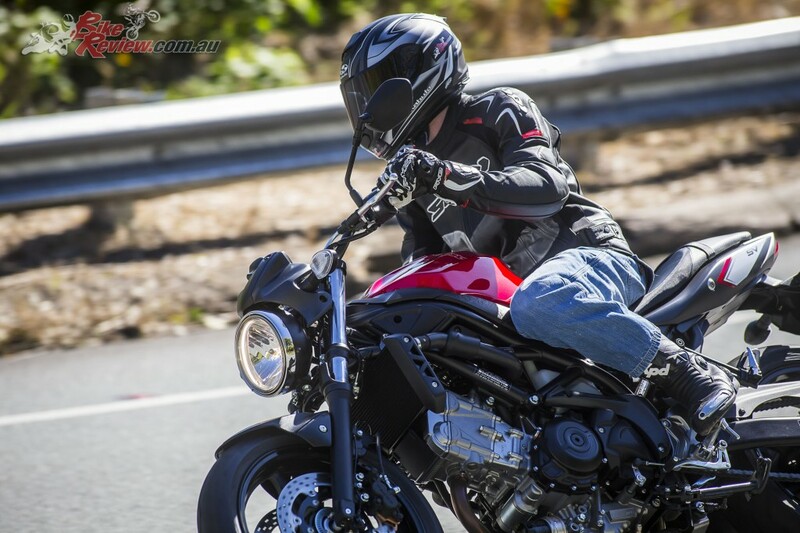 There’s plenty of room for larger riders too and a day in the saddle left me grateful of the SV650’s good ergonomics. 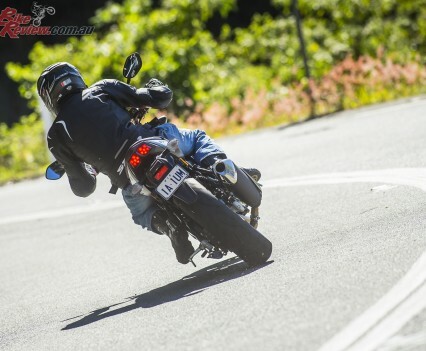 Another strength with the new SV650 is the suspension, I’m 70kg, but found the setup ideal for my weight, where the previous Gladius tended to be much softer and more ideal for touring. 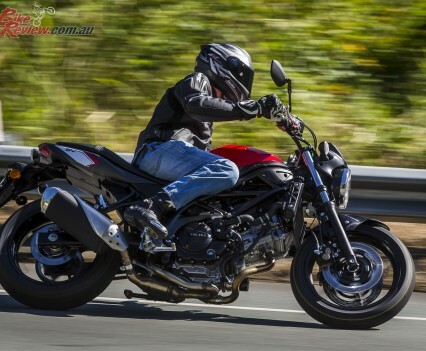 On the SV650 it’s sharper, without the Gladius’s propensity to squat under hard acceleration. The front is also well supported by the 41mm forks, although I’ll admit to finding it a little vague through the real twisties if I wasn’t shifting my weight forward and committing. The rear Link-type shock is pre-load adjustable but provided good damping out of the box for me, with both ends keeping the Dunlop tyres glued to the road across a variety of conditions. Even heading along back roads where the entire road was littered with leaves and twigs except in the car tyre tracks the SV650’s nimble handling meant I could ride along at a good pace sitting in a single car tyre widths path. The one area that did stand out as different was the brakes. 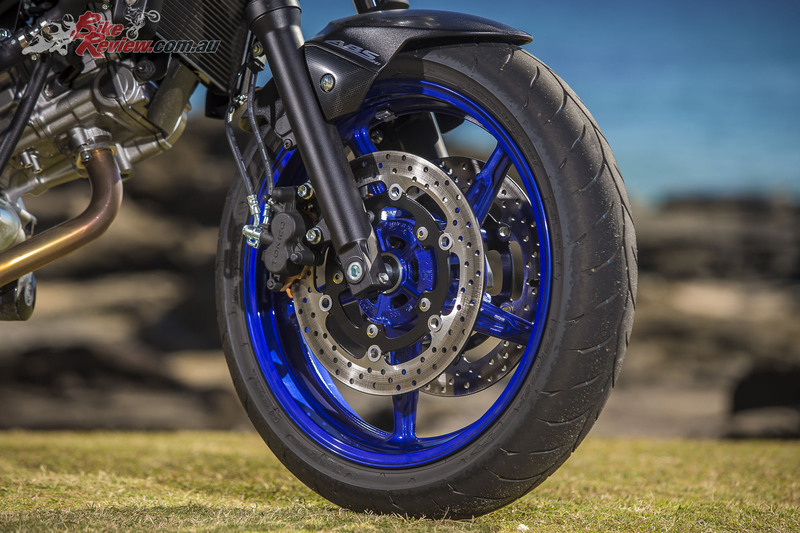 At 70kg they were extremely light on bite on the front end, with the dual 290mm rotors on the front matched to Tokico dual-piston calipers. What the front brakes lacked in bite they more than made up for in ease of modulation (control) with good stopping power. You needed to really apply force at the lever to get all that power, but even with ABS equipped it’s a more ideal solution for newer riders than brakes that stop on a dime at the first touch. 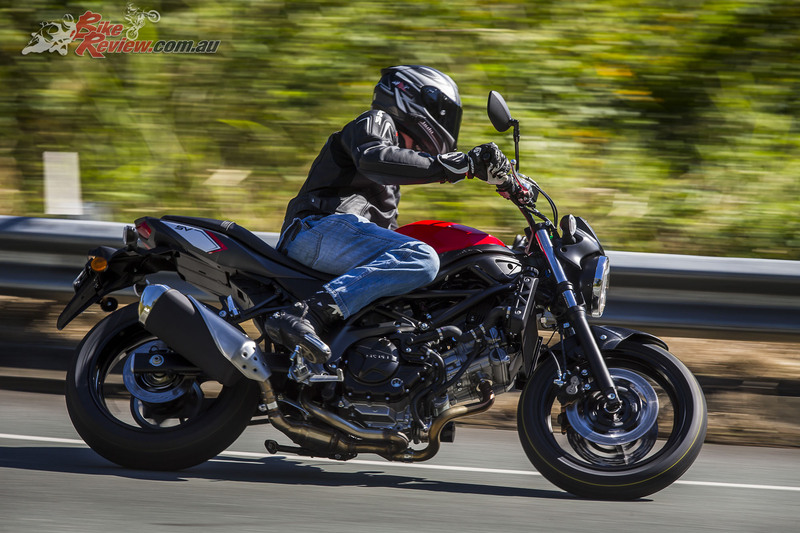 The 2017 SV650 is nimble and rides like the smaller capacity competition while still offering that maximised power to weight ratio under the LAMS system. The rear on the other hand had a lot of movement in the lever but not much bite or stopping power. 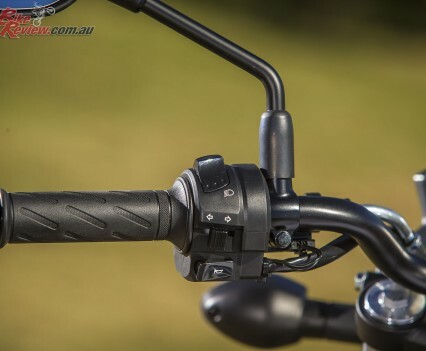 Sure… rear brakes aren’t for stopping, ideally they are for control and a little trailing for stability, but I would have liked the rear brake lever to be a little firmer, so I don’t need to stamp down. 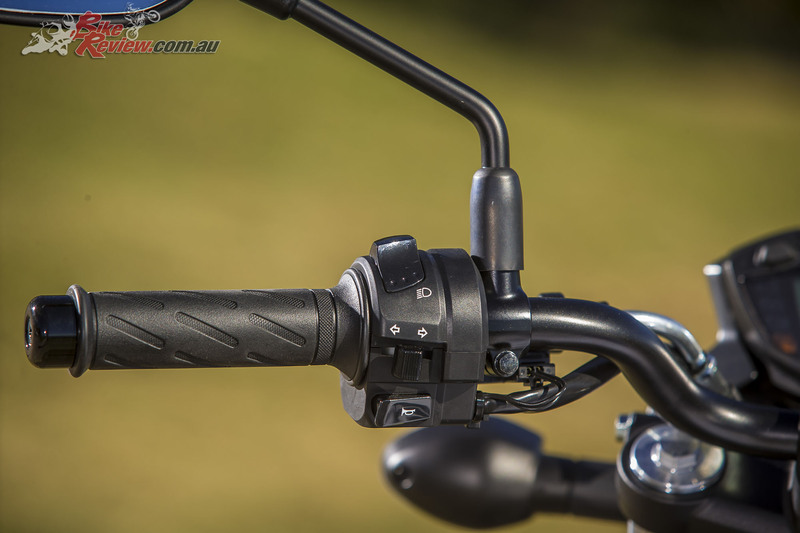 The other benefit of this brake setup is that it helped keep the bike balanced and stable while on the brakes, or transitioning on or off, whether that was to come to a stop, or through the twisties – finding a cager doing 5km/h around the next blind corner. 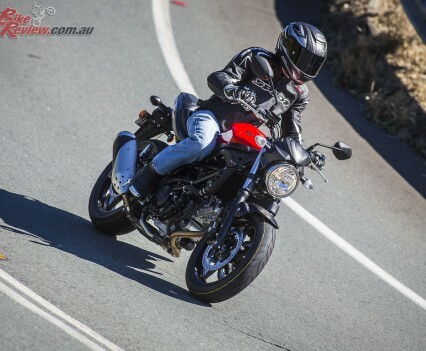 ABS is also standard on the SV650, which is another great boon, particularly at the price point, as the Gladius in Australia wasn’t brought in with ABS. 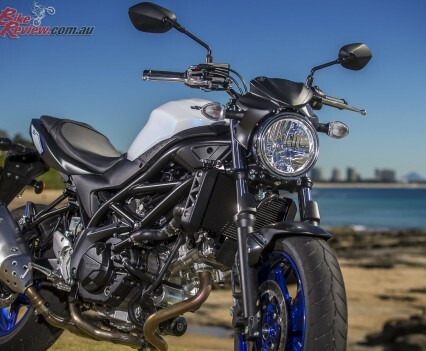 The SV650 is a real looker, with a more classic look thanks to the trellis frame, single round headlight and sporty tail. The Pearl Glacier White with blue wheels really stood out, as did the Pearl Mira Red model that I tested. The Metallic Mat Black hadn’t arrived while we were testing but should be available shortly. 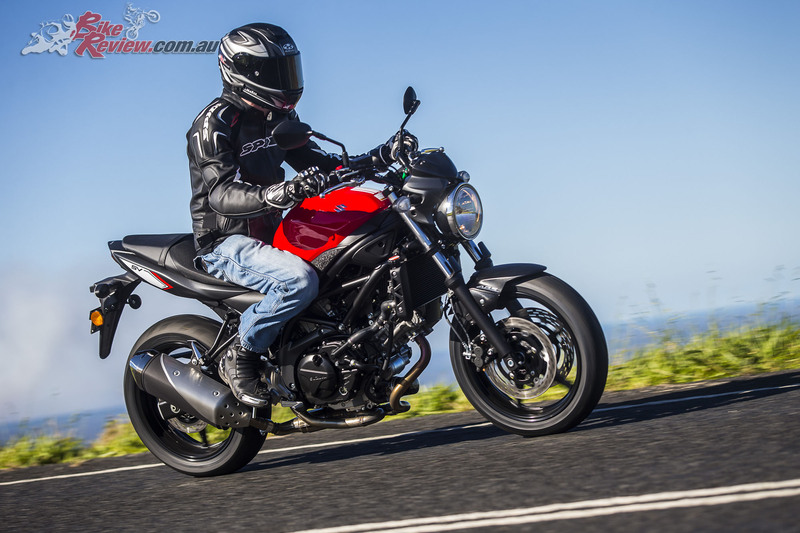 So where does the 2016 Suzuki SV650 sit in its category? To me in many ways it is quite a unique offering. 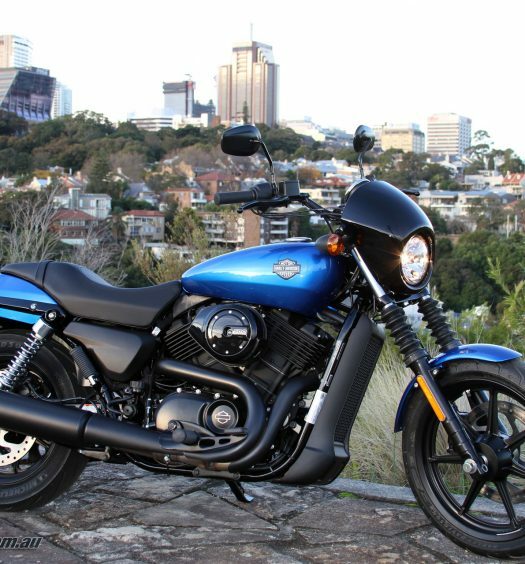 In my experience a common question, or problem, for prospective or new riders is finding a bike that is perfect for starting on but will also carry them through their LAMS period and beyond, especially for those worried about having to handle a large or heavy machine, or even one that’s a bit of a handful. If you’re of short stature though, then this is a machine you have to try! 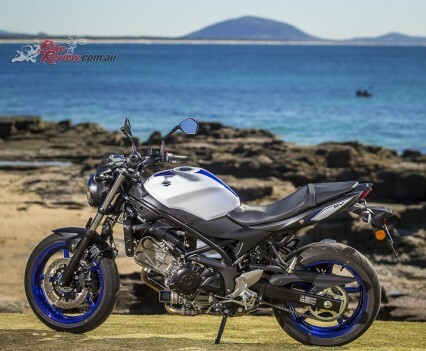 Suzuki have developed the SV650 with the level of LAMS insight that normally goes into the smaller capacity machines, but while still delivering the larger capacity performance and plenty of nifty features. The SV650 offers the ultimate starter package, never mind starting on a 125 or 300cc machine, then moving onto a LAMS 600 once you’ve got some experience under your belt. 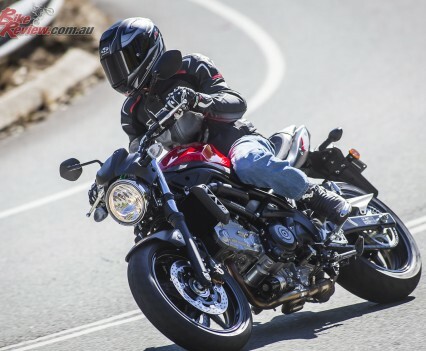 As a brand new rider you could start from day one on the SV650, thanks to the low seat height, comfortable ergonomics, great rideability, confidence inspiring handling, forgiving brakes and great standard features like ABS, Low RPM Assist and one touch starting. 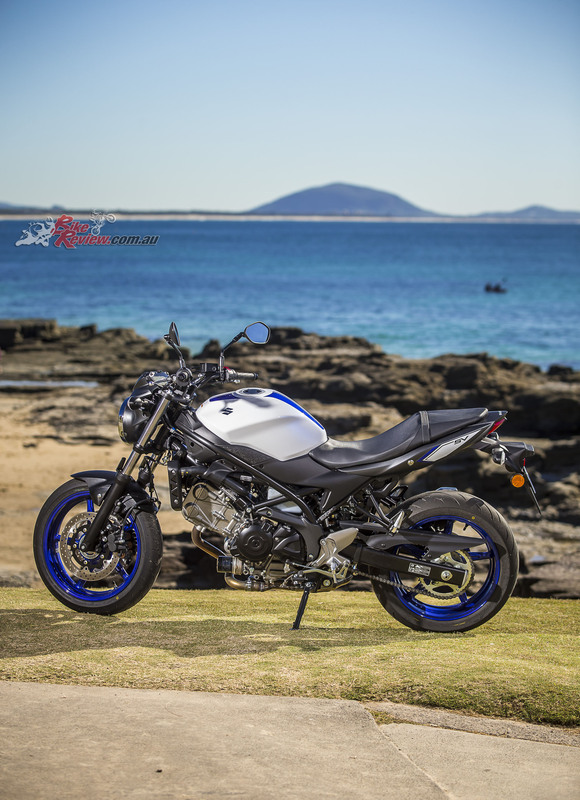 Styling is simple but timeless, you get the great characteristics of a V-twin, which you’ll appreciate even more with an aftermarket exhaust, and Suzuki have priced the SV650 ultra-competitively at $9,990 Ride-Away. That’s an absolute steal, especially with Suzuki’s servicing intervals now at every 12,000km. 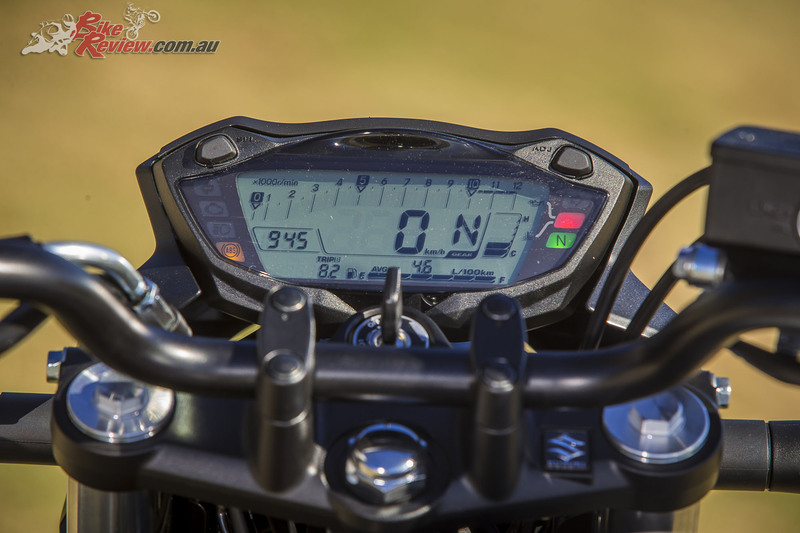 The Low RPM Assist function is sure to be a blessing for LAMS riders getting started, but wasn’t noticeable for more experienced riders. 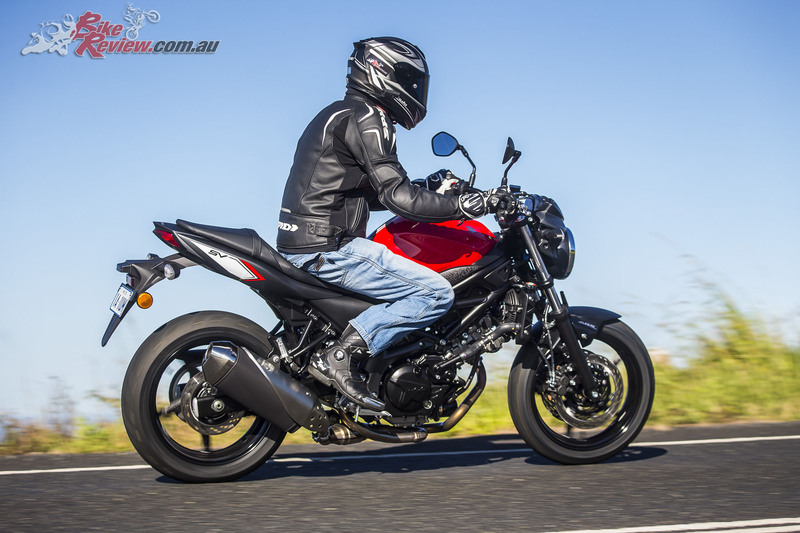 The SV650 for 2016 still uses a 645cc 90º V-twin but has seen a massive overhaul with 60 updated or redesigned components. These include FEM designed pistons, resin coated piston skirts, tinned sliding parts for better durability and less friction, SCEM plated cylinders and 10-hole long nose fuel injectors on each 39mm throttle-body which include a Throttle-body Integrated Idle Speed Control. Plus a Low RPM Assist function, redesigned air cleaner, and staggered airbox funnel lengths for better mid-range torque. 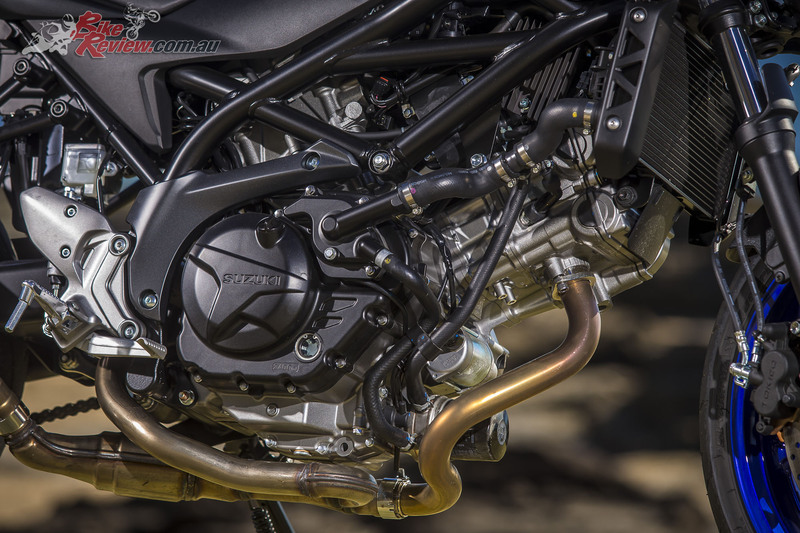 The cylinder head also using dual spark technology for combustion efficiency and fuel economy, with the SV650 Euro 4 compliant, or in other words complying to the latest strict European standards. Suzuki’s Dual Throttle Valve technology is also employed, with the 39mm throttle-bodies, while secondary throttle valves are controlled by servo motor. An O2 feedback system and intake pressure sensor also allow the system to maintain peak efficiency. 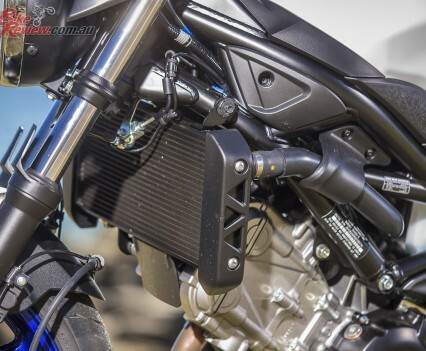 Suzuki’s Throttle-body Integrated Idle Speed Control (TI-ISC) assists with starting and running stability, while air flow while idling is regulated by the secondary butterfly valve system. The Low RPM Assist feature is another addition that takes information from the gear position sensor, TPS, engine rpm sensor and clutch switch and communicates with the ECM (Engine Control Management/ECU) and effectively autoblips the throttle as the clutch is released to counteract the natural reduction in revs as that normally happens. This effectively makes it harder to stall and ensures smoother transitions while releasing the clutch. 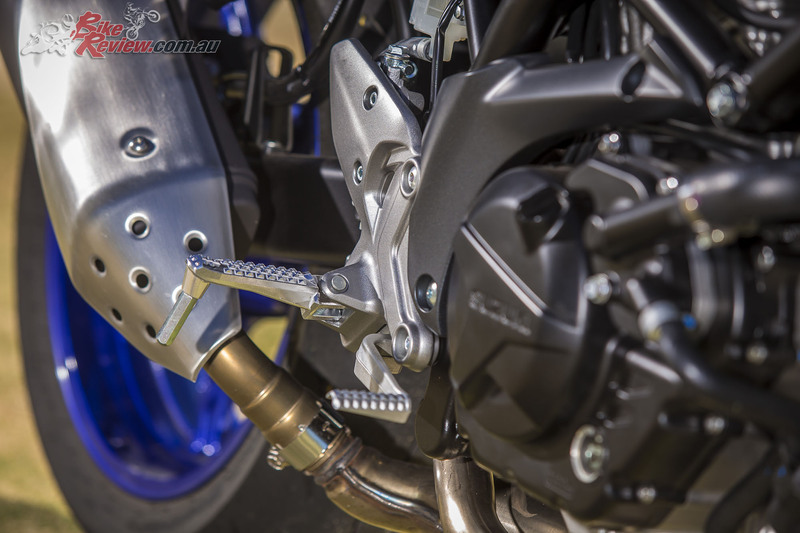 The exhaust is also a lighter system and does without the lower chamber featured on the previous Gladius allowing for a much cleaner look along the belly of the bike, while still including a catalyser. 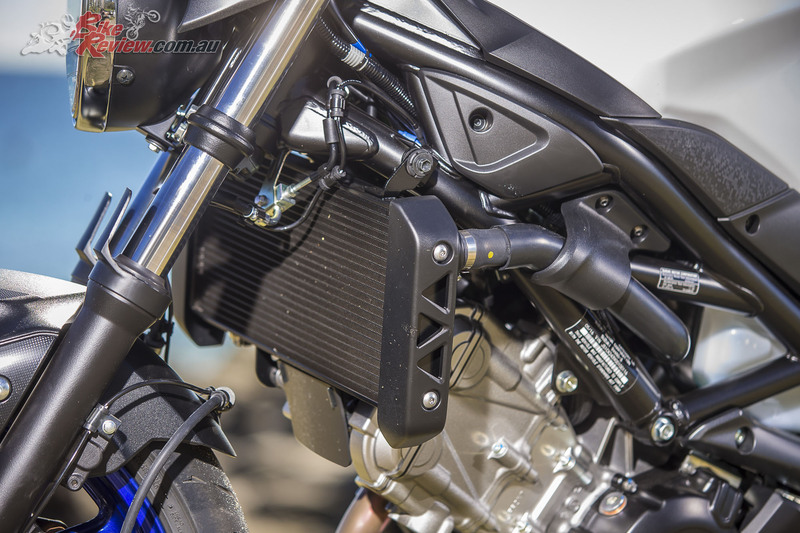 The engine cases are also updated for a sportier look over those found on the Gladius, with a new high efficiency radiator fitted for better cooling. 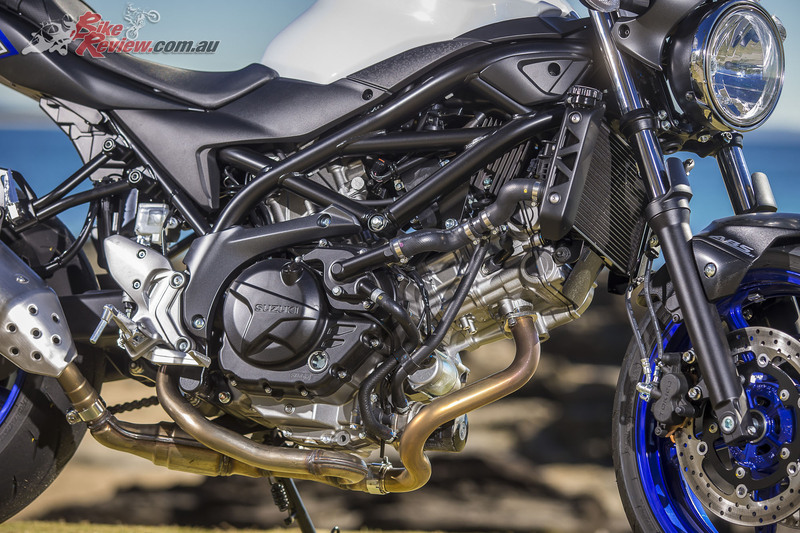 The oil filter is also located on the front of the engine allowing for easy changes, with Lewis from Suzuki Australia explaining the new SV650 is considerably easier to service and work upon, offering even greater savings in upkeep and running costs, including for valve clearance checks at 24,000km. Suzuki didn’t just overhaul the SV650 engine, with the chassis benefiting from 70 new or improved components, including a newly designed trellis frame constructed of lightweight steel material, with the 2016 SV650 saving 5kg over the previous Gladius, or 8kg over the ABS equipped Gladius. 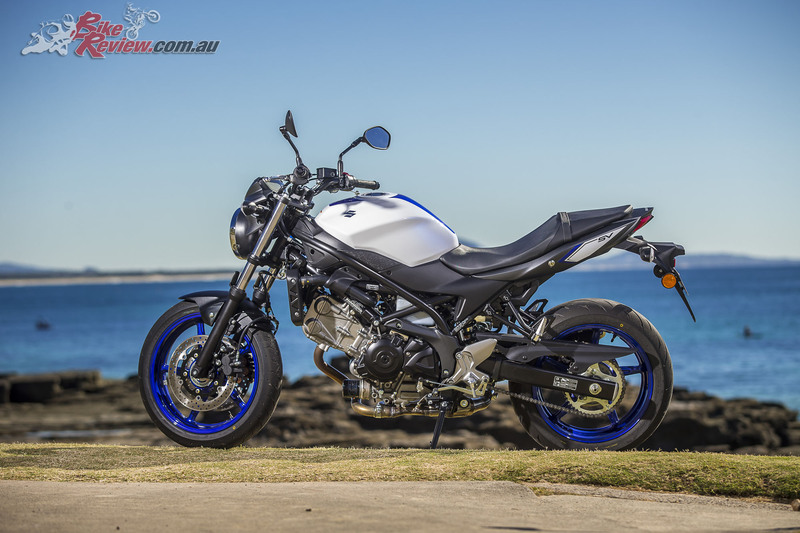 Changes to the chassis include decreasing the width of the bike across the tank, and at the seat, with the fuel tank width reduced by 64.5mm at its widest as well as the seat by 30mm, with a seat height of 785mm – the lowest in the SV650’s class. The fuel tank holds 13.8L, and 250km were covered sportily with ease before refilling. 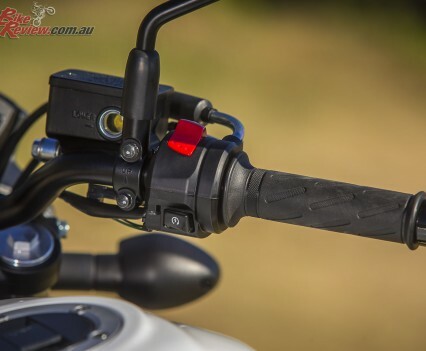 The rider foot controls are also separated from the pillion ‘pegs, unlike on the Gladius, helping to save weight. 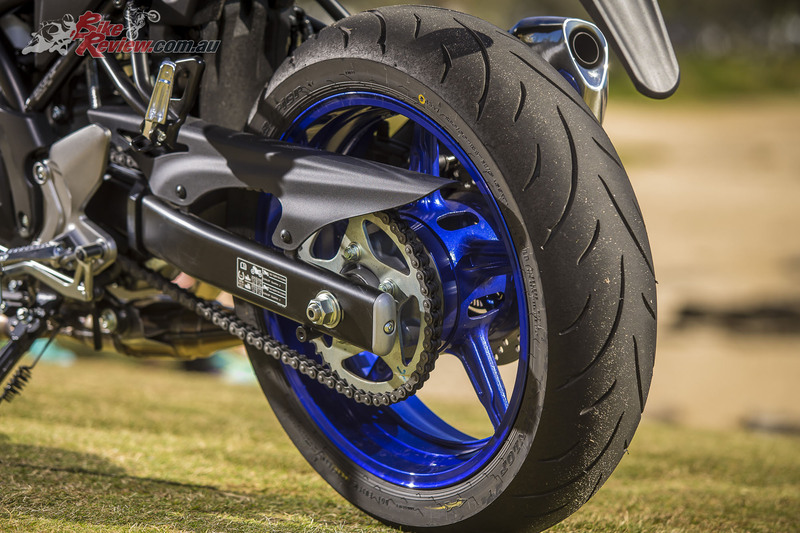 Forks are 41mm items with 125mm of travel, while the rear Link-type shock offers seven-way adjustable pre-load for different rider weights. Dual 290mm rotors on the front are matched to Tokico dual-piston calipers, with a new lighter Nissin ABS unit helping keep weight down. 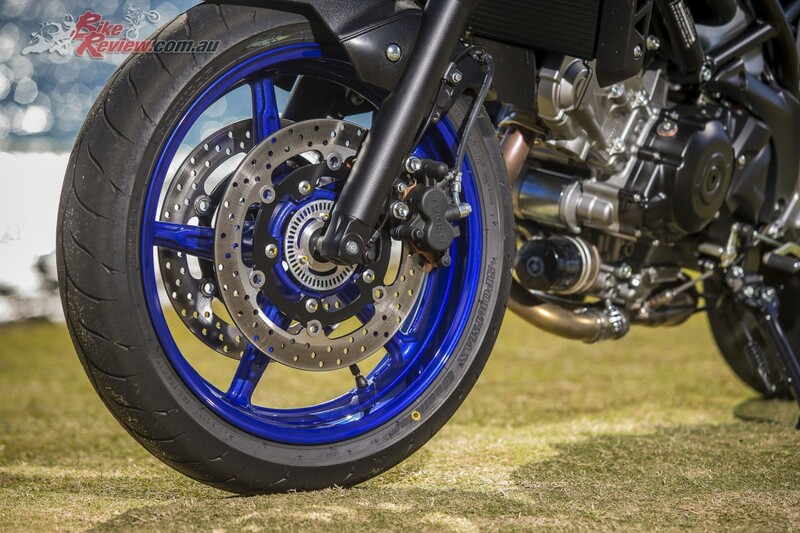 On the rear a 240mm rotor is joined by a single-piston caliper and also benefits from the ABS system. 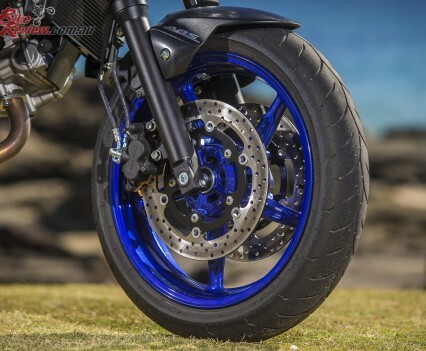 Wheels are TBR five-spoke cast aluminium light weight offerings with a sporty appearance, and Dunlop radial tyres are fitted as standard. 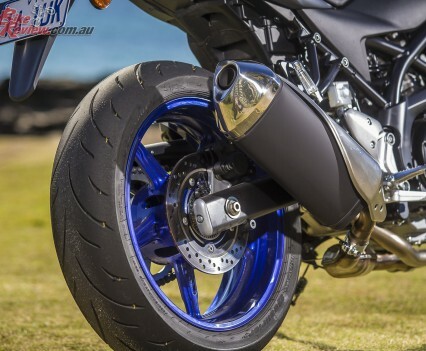 The SV650’s wheels are 3.50 x 17in and 5.00 x 17in, taking 120/70 – 17 and 160/60 – 17 tyres. 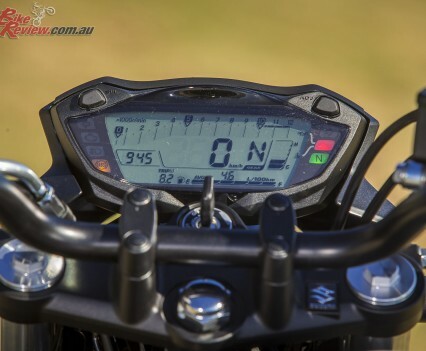 A full LCD display is a nice touch and keeps everything compact, while offering a gear indicator and clearly visible ‘idiot lights’ including when you’ve left your indicators on! 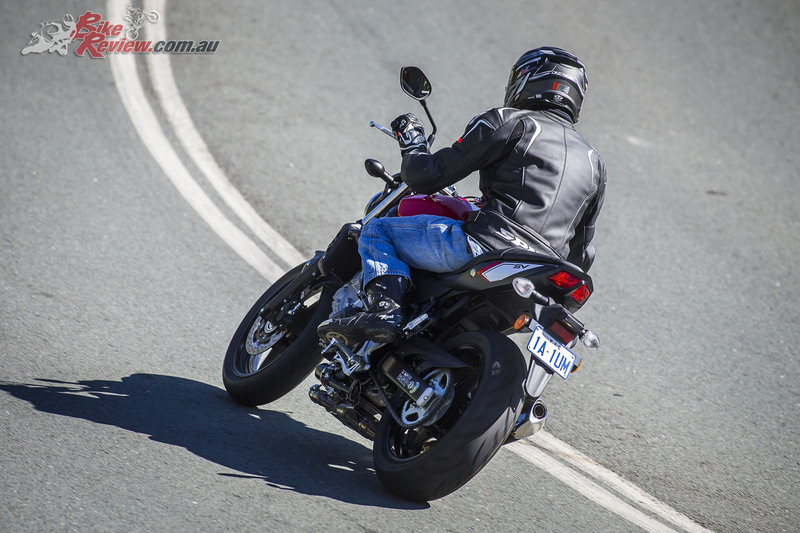 With the 2016 SV650 Suzuki have looked back at the original 1999 model and returned to the basics, in an effective move to create broader appeal for the SV650. The SV650 features organic lines from the trellis frame, through to the tail and the simple single headlight, with a well integrated fully digital LCD multi-function display including gear indicator, LED tail lights and single low muffler. Racing stripes across the tank’s deep paint on the Pearl Glacier White and Peal Mira Red mirrors help lend the SV650 a sporty look, especially on the Pearl Glacier White, which features a blue racing stripe, which matches the blue cast aluminium wheels. ABS comes as standard in the $9,990 Ride Away introductory pricing, along with the Suzuki Easy Start system – one touch starting in neutral, along with Low RPM Assist and Throttle-body Integrated Idle Speed Control. 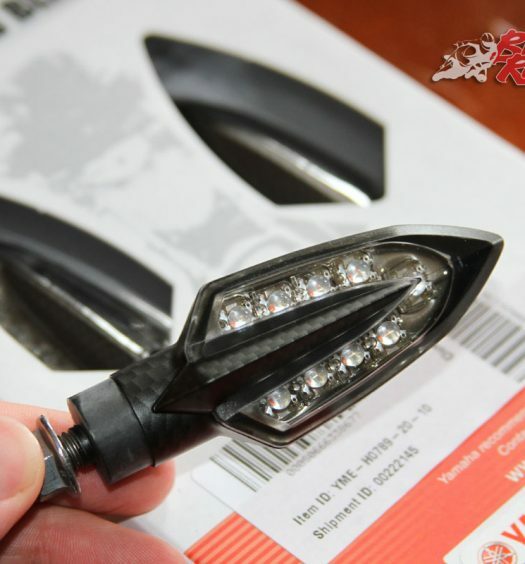 Suzuki are still developing a range of SV650 accessories.